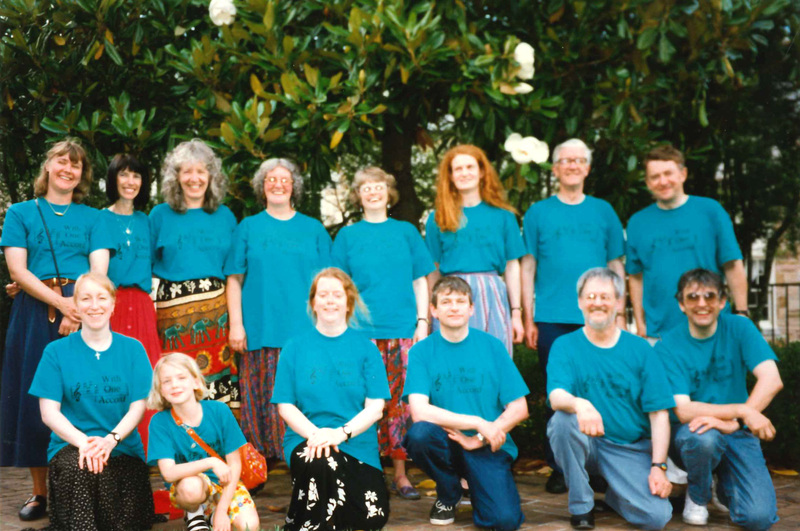 Helen Brown, a member of the group, and today a stalwart of the National Convention’s arranging committee, explains how the performance came about. 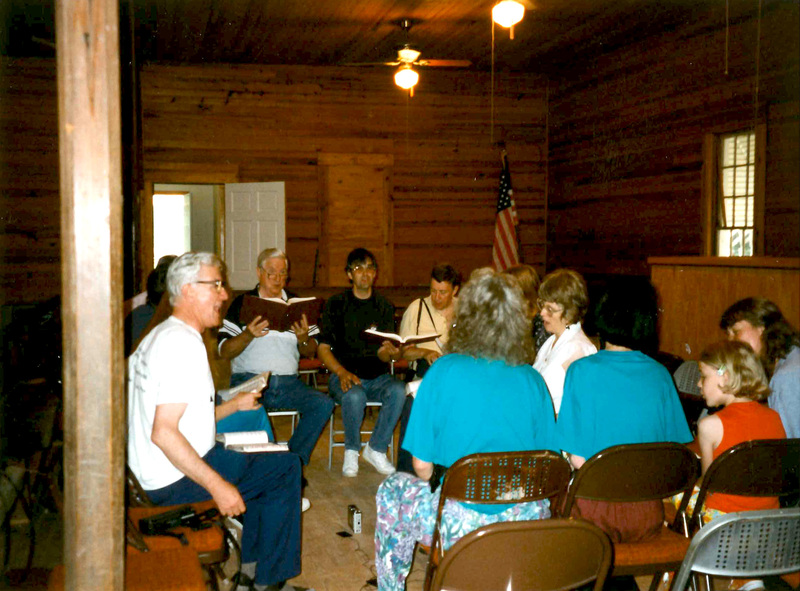 In 1997, a group of fourteen singers from the United Kingdom formed a scratch choir we called “With One Accord.” Our intention was to perform concerts of music from the English West Gallery tradition (a music practice in which Sacred Harp has some of its roots) in the heartland of Sacred Harp and to culminate in attending the National Sacred Harp Convention in Birmingham, Alabama. 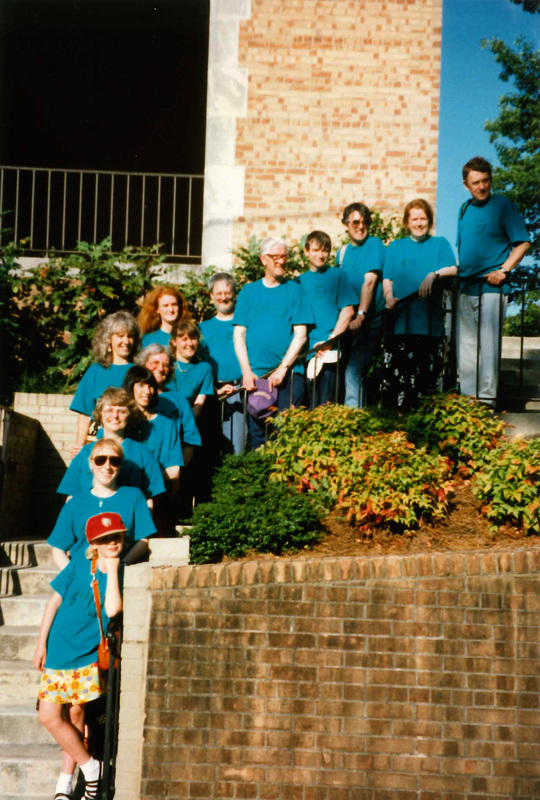 With One Accord outside Trinity Baptist Church, Homewood, Alabama 1997. The music we performed was from the rich and varied tradition of eighteenth- and nineteenth-century English rural parish and non-conformist church music. The construction of special galleries to house the singers and musicians at the west end of churches gave rise to the name West Gallery Music for this style of sacred song. Mainly metrical psalm settings, the music consists of plain tunes and more intricate fuging tunes with robust harmonies and rhythms which would have been performed in an uninhibited fashion by a band of local singers and musicians (known as the Quire), essentially formed to help lead the worship in church. This music fell from favor by the Victorian era; the bands were replaced with organs and the quires were disbanded. The music only survived in the carol-singing traditions of the West Country, South Yorkshire, and Derbyshire until the past thirty years or so when enthusiasts revived interest in this music, performing pieces rediscovered in old and dusty church manuscripts. Unlike Sacred Harp, West Gallery music is revivalist and mainly performance music. Yet there are many similarities between the two styles, and both are exhilarating to sing and a joy to share. Our trip began in Atlanta, where we were hosted by the congregation of the First Baptist Church in Tucker, Georgia. We performed a couple of concerts around this area, including an evening concert at the church, where the audience included Sacred Harp singers John Plunkett, Judy Mincey, and Lee Rogers. 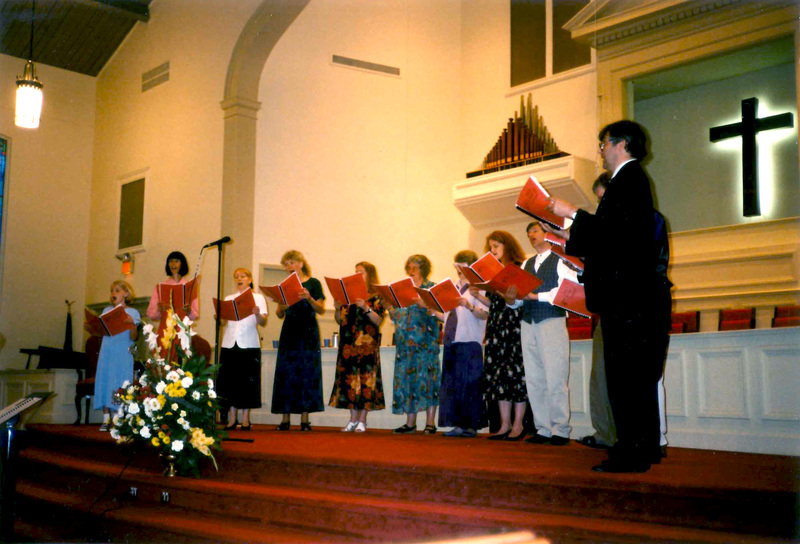 The choir performing a concert at First Baptist Church, Tucker, Georgia. With One Accord singing with Hugh McGraw at Holly Springs Primitive Baptist Church, Bremen, Georgia. The next day we headed off on I-20 with a scheduled stop which would have been unthinkable for us not to make. We arrived at Holly Springs Primitive Baptist Church in Bremen, Georgia, where Hugh McGraw was waiting to meet us. We were privileged to visit with him for a couple of hours, chatting and singing for a while. I particularly remember that Hugh called “War Department” (p. 160t in The Sacred Harp); the majority of us were not at all competent in reading the notes at this time and the song was pretty much a train wreck! We got lost as we headed into Birmingham—no GPS in those days! A frantic phone call brought Buell Cobb out to meet us and we were guided in to the Church of the Advent, where we were to give a concert that evening. I seem to remember that the church was fairly full for the concert, with quite a few folks in the audience who had arrived in time for the National Convention. After the concert we had dinner with Buell at a small restaurant in Homewood and then we were ferried out to our various housing hosts. The National Convention met at Trinity United Methodist Church, Homewood, and we arrived on the first morning in great anticipation of what we were sure would be a wonderful experience. As we registered, we were warmly welcomed by several folks in the reception area, amongst them Judy Hauff and Jim Carnes, as I recall, and then, later on, Amanda Denson. As the first group of UK singers to attend the convention, there was great deal of interest in us—and our strange accents! We met so many people, all of whom were so wonderfully welcoming. The buzz in the hall was already vibrant, and as the first notes were given, the singing began. I can only say that, from that first moment, I was blown away by the sound in that room. The energy was almost tangible and the sound was like nothing I had ever heard. I had been singing Sacred Harp music for about eight years in a small group and had, of course, heard recordings, but this was on a completely different scale. I was totally overwhelmed by the sound and the emotion and, after a little while, felt that I had to move to escape an intensity which I was not used to. Also, despite being able to read music, I did not read the shapes very well at this time and was experiencing a very steep learning curve. After the recess, I went to sit in the balcony area overlooking the singing space, just to let the experience sink in and to give me a moment to acclimatize, as it were. It seemed that many of the group had the same idea and I think that the majority of us spent much of that first day just revelling in this wonderful, incredible sound, struggling with the volume and the emotions which were being evoked, but enjoying it from a safe distance. With One Accord outside Trinity United Methodist Church, Birmingham, Alabama. As the three days went by, we all became a little more used to the intensity (which only heightened on Friday) and felt more able to be a part of the singing square, surrounded, carried, helped, and encouraged by the singers around us in our sections. It was such a privilege for me to sing in the treble section with singers including Freeman Wootten, Shelbie Sheppard, and Mary Lambert within earshot (of course I had no idea who they were at the time) and I wholly reveled in the entire experience. On several occasions I would just stop singing and let the sound wash over me whilst I watched some of the older ladies, particularly, leading their songs so gracefully. It was an inspiring experience for which I am so grateful. I can only speak for myself in relaying what happened (albeit a dim and distant memory from nineteen years ago), but I know that being a part of this convention had a profound effect on most of the group. What I can say, however, is that the trip completely changed my life; Sacred Harp in its entirety has been a blessing and has truly enriched my and my husband Ted’s lives. This entry was posted in Just a Minute. Bookmark the permalink.